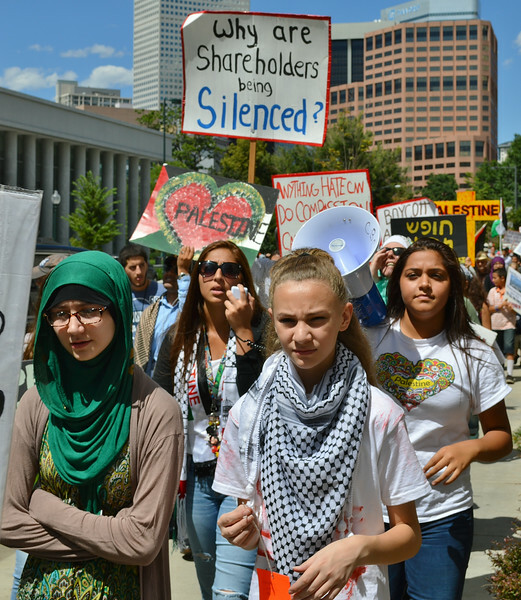 Palestinians and supporters rally and march in Denver Colorado to protest Israeli attacks on Gaza. 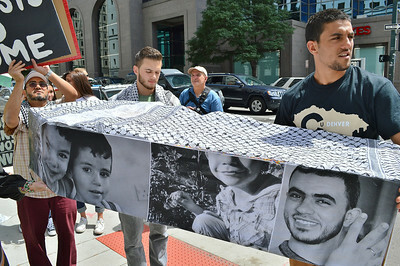 Young man carrying mock coffin with phtographs of people on it. 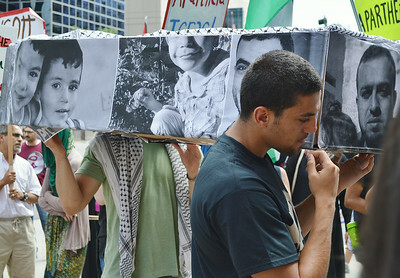 Two young men carrying mock coffin with phtographs of people on it. 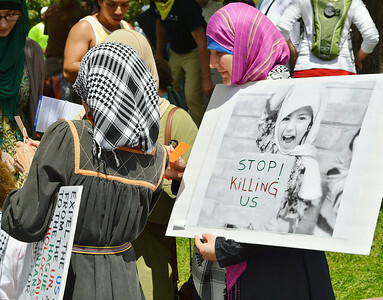 Woman wearing hijab, holds sign with picture of Muslim girl holding sign with "Stop Killing Us" on it. Young woman carries bullhorn, other woamn speaks into microphone, protest signs in background. 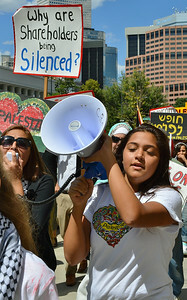 Young women marching in protest, one wearing hijab, one wearing a Keffiyeh, one carrying a bullhorn, one speaking into microphone, other demonstrators with signs in background. 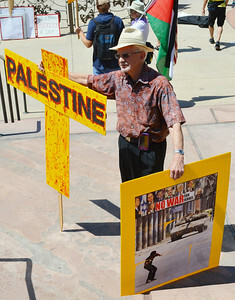 Man raises sign about Palestine above head, sign has writing on it in (Arabic? ?, Hebrew?? 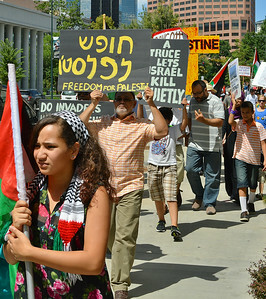 ), young girl carrying Palestinian flag in foreground, marchers with signs in background. 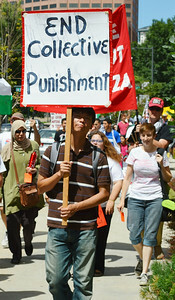 Young man carries sign, "End Collective Punishment", other protesters marching in background. 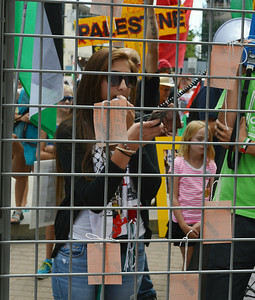 Young woman woman speaking into bullhorn microphone and looking at cellphone,protesters with signs in background, all seen through a wire cage. 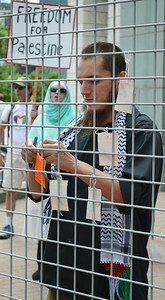 Young man wearing keffiyeh, attaches tag to cage. 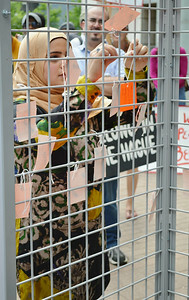 Young woman wearing hijab, hangs tag on wire cage, other tags hanging on it. Young man with red mohawk haircut, wearing all black, belt with meatal studs, chaion on belt, raises fist, while holding sign about Israel and Palestine. 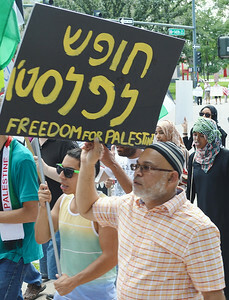 Man raises sign about Palestine above head, sign has writing on it in (Arabic? ?, Hebrew?? 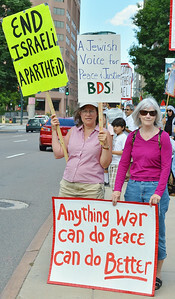 ), other marchers with signs in background. 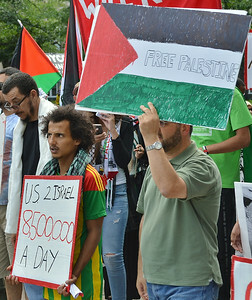 Man with large white scarf around neck, in background, protesters marching with signs and Palestinian flags. 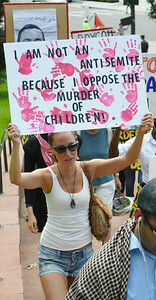 Woman holds sign above head about children being killed and not being antisemite, other protesters with signs behind her. Woman wearing hijab, with drumsticks and drum, young boy standing next to her. 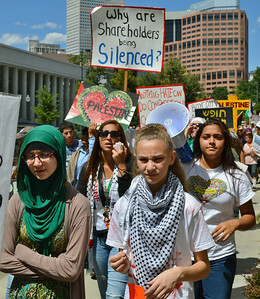 Three young women wearing hijabs, standing, talking, one holds Palestinian flag on pole.